Adobe Photoshop is an extremely powerful post-production tool and was developed for graphic artists, designers, illustrators, and photographers alike. What does this mean? Well, it means that Photoshop has more features than any photographer is ever likely to use for processing photographs. But it also means that this is one of the best platforms to enhance your imagery. The ability to use Camera Raw with Layers and Masks will enable you to take your images to the next level, whether you just want to enhance a single image or composite multiple images and textures to create an entirely unique piece of art. The goal of this book is to introduce Photoshop and its features to photographers and to demonstrate how these tools may be used from the photographer’s perspective. Throughout this book, I will use images, and screenshots to demonstrate various techniques commonly used by photographers in Photoshop. If you download the iBooks version, you will also get enhanced functionality, such as built in videos and interactive galleries to help reinforce what you are learning. 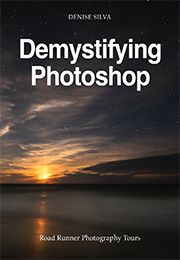 We have 3 easy ways to purchase Demystifying Photoshop. You can purchase a copy from iTunes using the button below, you can purchase with a credit card using the other button below or you can purchase using PayPal by clicking on the small text below the picture of the book above that says “buy”. If you use PayPal from our site you will be taken to PayPal to complete the transaction. There will be a page on the PayPal site that takes about 10 seconds to refresh. During this time PayPal is communicating back to our site that you completed the purchase. Upon return to our site you will taken to a landing page and there will be a link to download the book. If you have any difficulties please e-mail don@roadrunnerphotographytours.com, please allow sufficient time for me to respond.